Dental implants are the most stable and sturdy way to replace missing teeth and restore your smile. If you have missing teeth, implant dentistry is a great way to repair and restore your smile. It is important for your overall dental health that you have a full set of teeth. Dr. King Scott’s dental office is here to help by restoring and repairing your smile. It is important to replace missing teeth as soon as possible, because missing a tooth puts you at risk for losing more teeth or even bones. If you have a missing tooth or teeth, you’ll start by coming in for a consultation. Dr. Scott will assess the state of your smile and ensure that you have adequate bone density to support dental implants. Titanium posts will be inserted into your jawbone where the replacement teeth will go. They will be allowed to heal as they bond with your jaw over time, creating a strong base for your dental implant that mimics the root of a natural tooth. 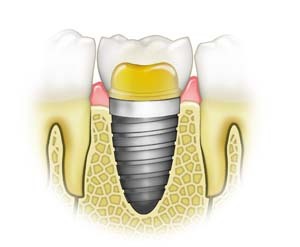 Once healed, your dental implant will be attached to the post, giving you a complete smile once again. Your replacement tooth will be carefully designed to match your natural teeth, giving you confidence in your smile once again. Dental implants are a great way to improve the function and appearance of your smile. If you think this could be the right solution or want to know more, give us a call. We’d love to schedule a consultation to see if dental implants can help restore your smile. Dr. King Scott has provided quality, full-service dentistry to patients for over three decades. His West Monroe, LA dental office serves patients from Monroe, Ruston, Rayville, Farmerville, Columbia, South Arkansas and greater North Louisiana. Call our office today to schedule your appointment!